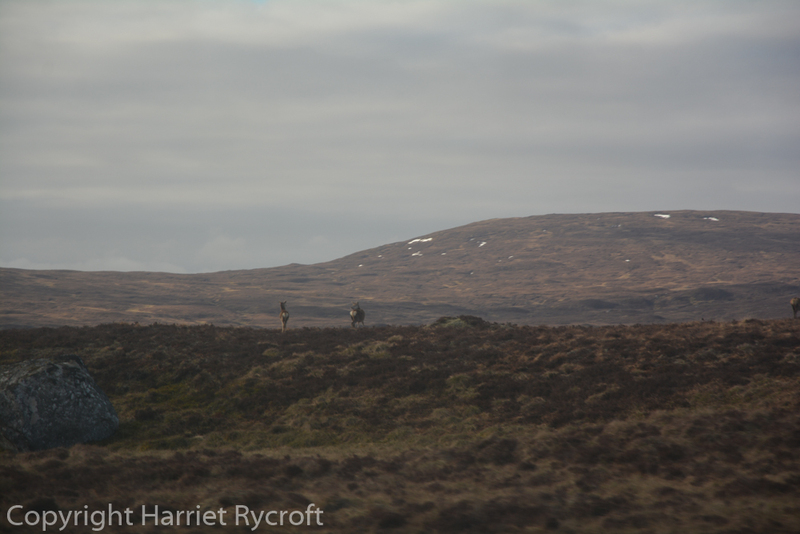 We’ve just been to Scotland for the first time for years. 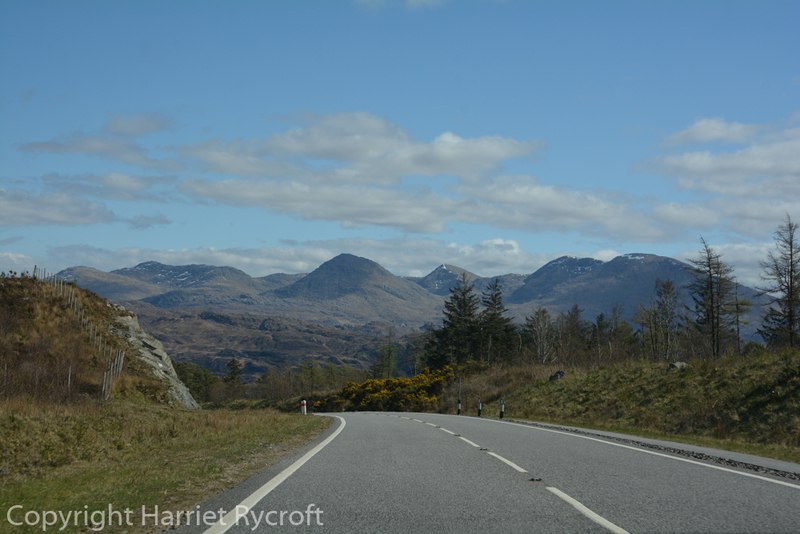 West coast – just beneath Skye, a long, long way from the Cotswolds. Chris insisted that we go because it was a chance to stay in a house originally designed by his favourite architect, Philip Webb, while attending a conference about PW and other Victorian/Arts and Crafts architectural topics. Chris’s hobby is architectural history so I’ve asked him to do a guest post for me about the house and the reason for the conference, which will come later. 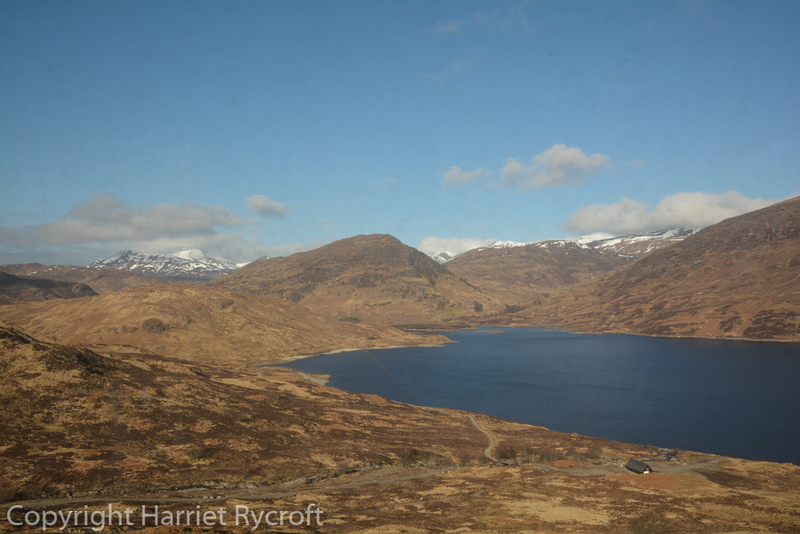 I was just as excited about the journey as the arrival because Chris had booked us on the Caledonian Sleeper to Fort William, where we’d join the train to Mallaig. First impressions were good as we had a wonderfully cheery welcome at Euston Station from one of their professionally Scottish hosts. He warned us that we had a long walk as our berths were at the front of the train, how we laughed at his little joke! 10 minutes later we were still walking and wondering where the hell the end of the train had got to. It was lucky we had arrived in plenty of time. Another couple of miles to go, Chris. It was also lucky that our berths, when we eventually found them three miles down the platform, were at one end of the corridor because neither Chris nor our biggest suitcase really fitted down it very easily. I thought Chris had been a little extravagant booking two interconnecting cabins but as each was tiny this turned out to be a wise move. Neither of us is exactly slender. To tell the truth the cabins and the seats on this train are a just a little on the shabby side but excitement at our adventure made us overlook this fact. Also someone had mentioned on a recent documentary that people pee in the little wash basins, which was just slightly off-putting. Our “sleep-over kits” included useful flannels, socks, earplugs, hand lotion and “pillow spray”. I gave mine a cautious sniff and gagged. Why would anyone want to spray Eau de Fake Lavender air freshener on their pillow? Apparently the sleeper is due for a face lift soon. As the train chugged out of London we settled down in the buffet car for our meal, which was sort of included in the price (there was some kind of special offer on our tickets, I think it may have been a BOGOF). The kitchen consisted of one (very friendly) man and a microwave so it wasn’t entirely surprising that the food was not exciting – it was Chris’s birthday, so we weren’t going to get too upset about it. Even though my puddle of macaroni cheese inexplicably had mustard in it I remained cheerful because there was a whisky list! 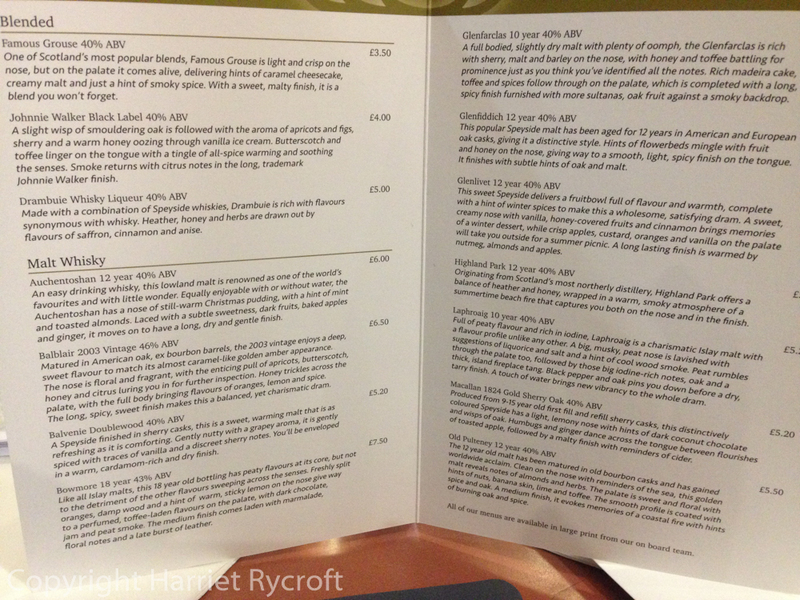 Yes, a whisky list! Complete with entertainingly flowery descriptions. This made everything all right. Whisky list. Yes of course we did. We slept OK, apart from a few bangs and crashes somewhere around Glasgow. Chris was too wide for his bunk and had one arm trailing on the floor but I was fine. I awoke to the sound of Chris trying to wrench open his blind. Reluctantly I followed suit and after a few minutes of swearing and tugging I managed to open mine. 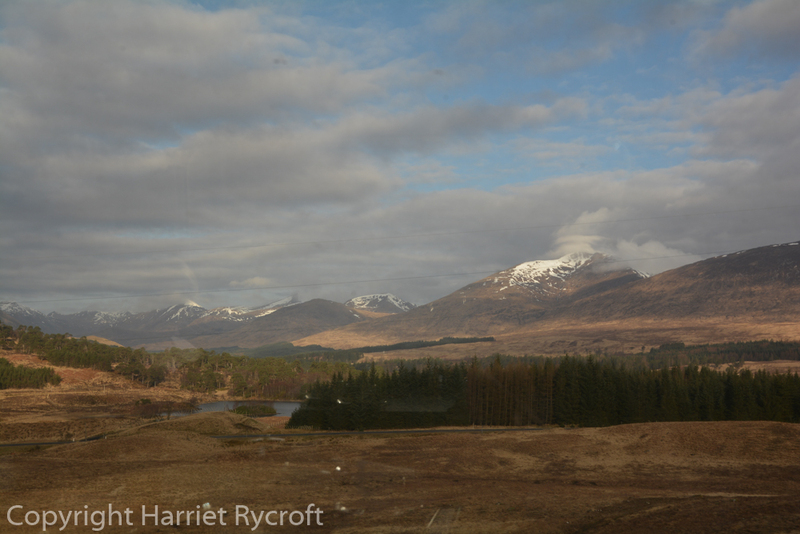 Here we were, on the West Highland Railway, Rannoch Moor rolling past. The view from my bunk. 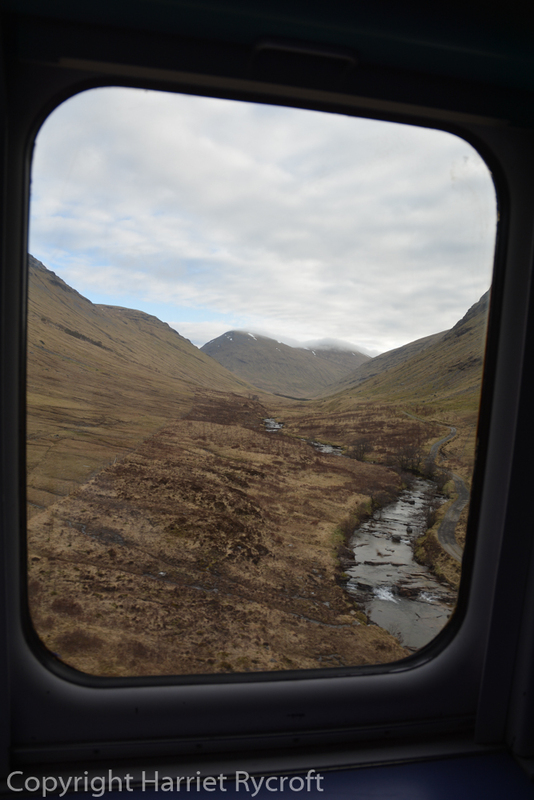 Fort William was the end of the line, so we had plenty of time to manoeuvre our bags down the corridor. By now the train was, thankfully, a lot shorter (hence the banging and crashing). We had two hours to spare before our connection, so we put our bags in a locker and wandered up the high street, marveling at how quiet it was, how clear the air, and playing the “What if we lived here?” game (we do that a lot). 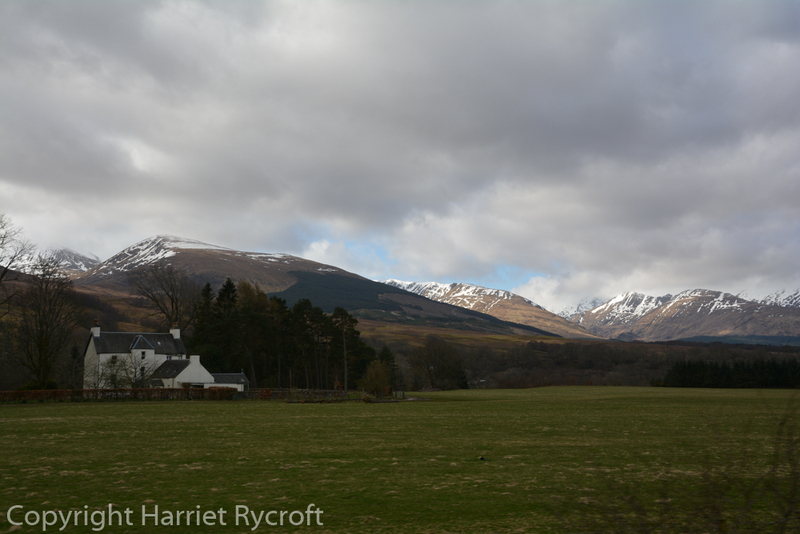 Our friends from the train had told us to go to The West Highland Museum, which we duly did. The volunteer staff were welcoming and the exhibits fascinating – Bonnie Prince Charlie’s this and Bonnie Prince Charlie’s that plus lots of interesting stuff about Highland life, the clearances, derring-do in World War II, natural history and much more. We could have spent the entire two hours there quite easily. 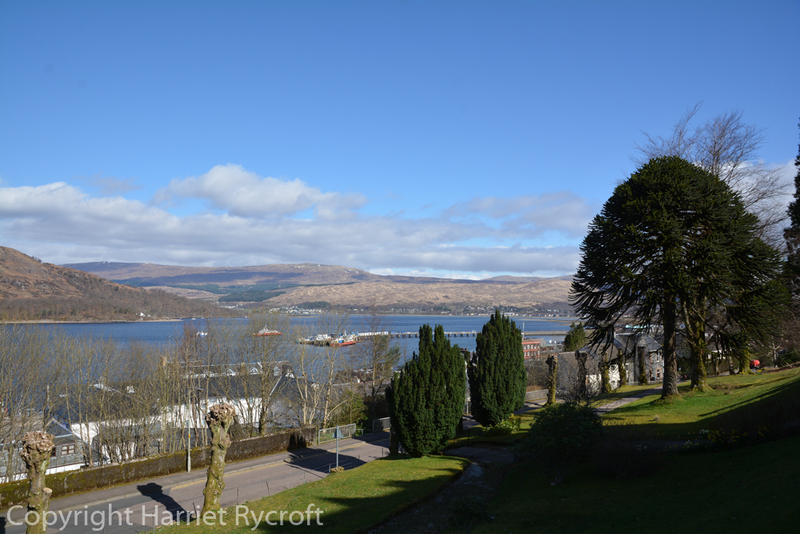 The view from The Highland Hotel, Fort William. Excellent monkey puzzle. Perhaps we could live in this one? 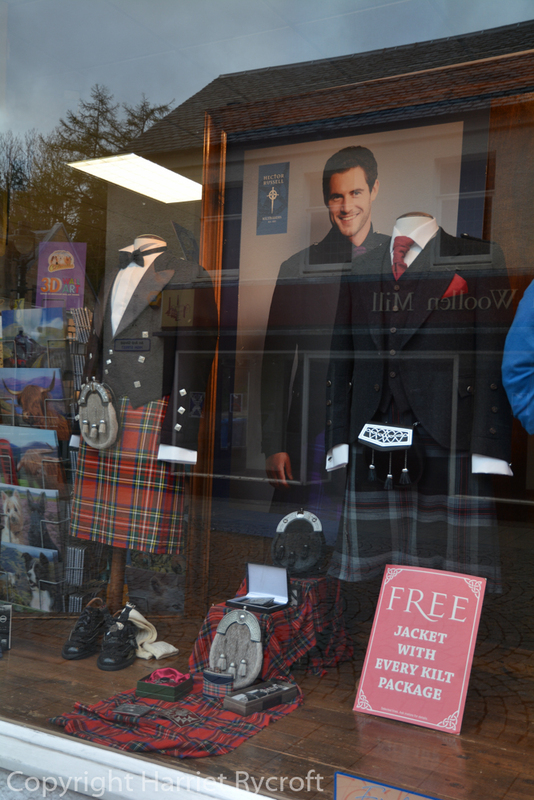 Get your kilt package here. Fort William’s station used to be a lovely vaguely castellated Victorian concoction but that was obliterated in the 1970s and replaced by an ugly nonentity. There are showers and lockers there, however, and little gift shop run by a man who thought I was going to steal his postcards, judging by the way he watched me – admittedly I must have been looking pretty disreputable by that time. There’s also a nice little caff selling good coffee (hurray) and tasty flapjacks. Breakfast number two. 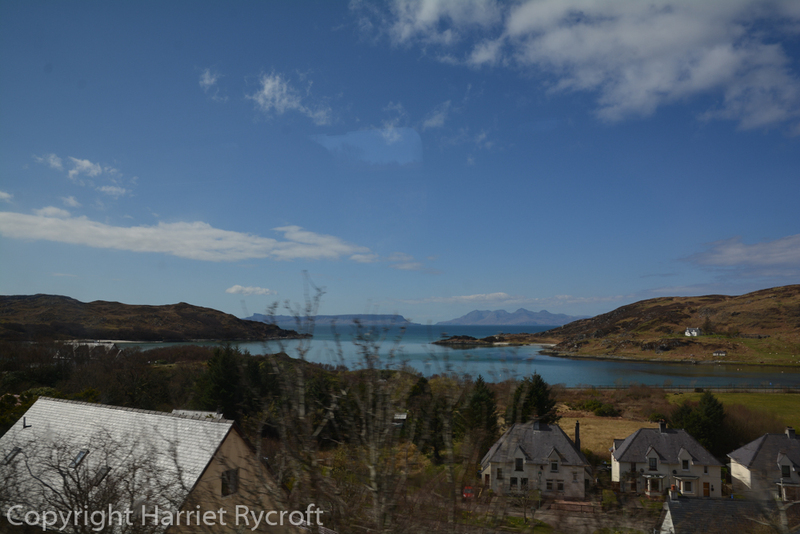 Then it was time for the train to Mallaig. 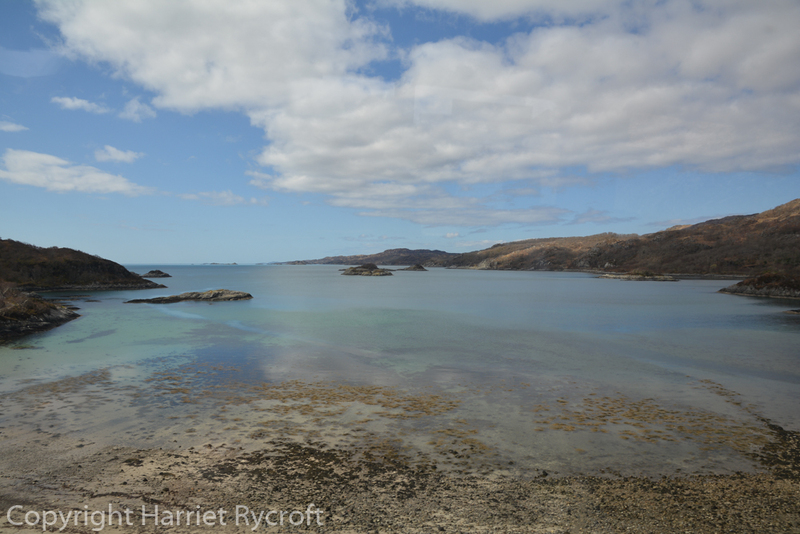 In the summer there’s a steam train called The Jacobite which runs on this line, but we were still all agog to be boarding the diesel and managed to bag good seats on the seaward side. 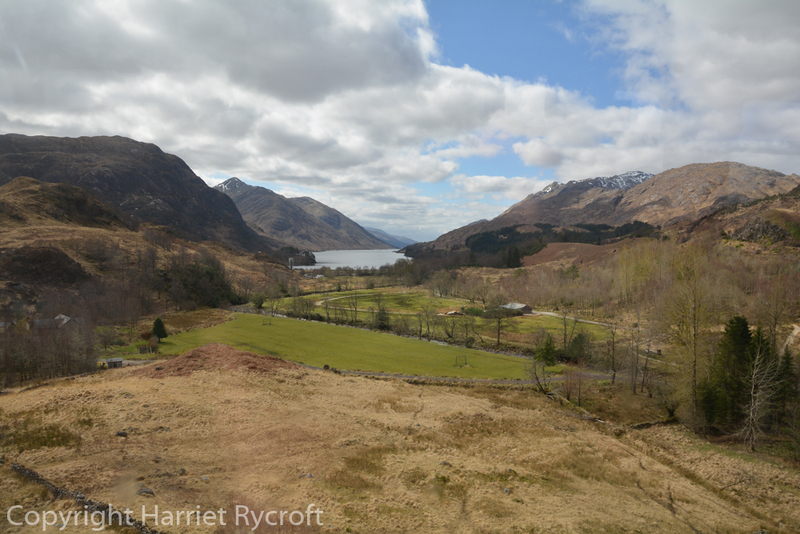 It’s important to sit on the left as you head west because that’s how you get the best views of the Glenfinnan Viaduct, which was made famous by the Harry Potter films. 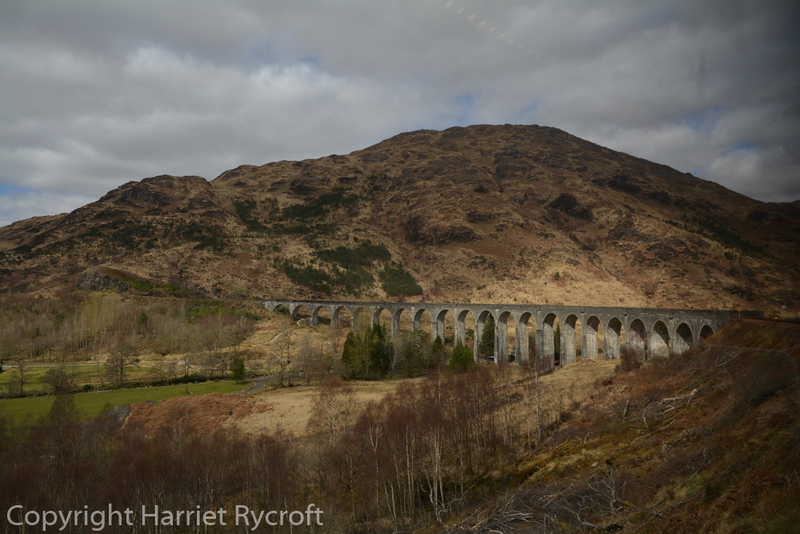 There were Harry Potter fans of several different nationalities on the train, and much jostling for position as the viaduct approached. It was good to see youngsters excited about a real view rather than a picture on a screen. 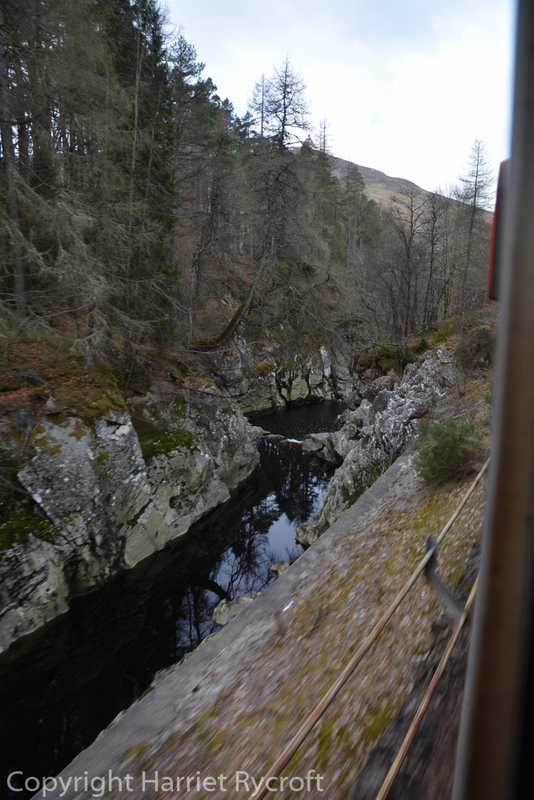 The viaduct (completed in 1898) was spectacular but everybody was loving the other scenery too – after Glenfinnan there are more lochs and hills, then glimpses of blue sea, white sand and islands which actually made me gasp. 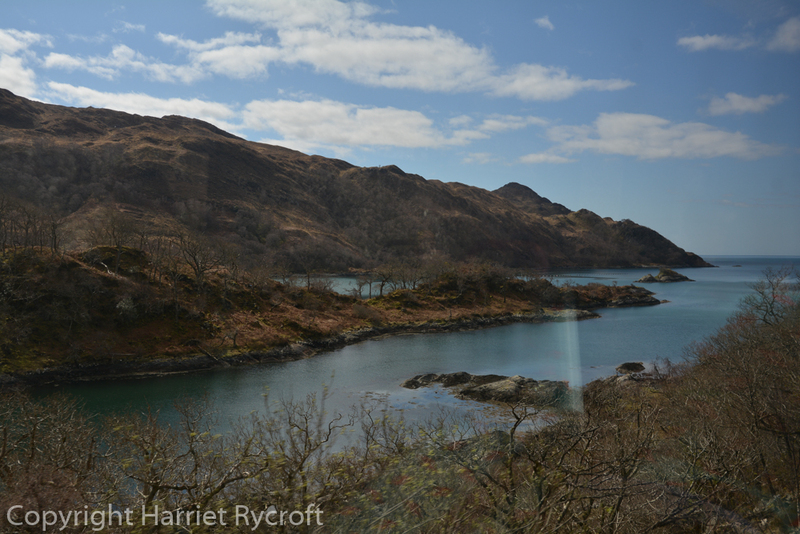 I apologise for the window reflections in these photos, but as you can see, it was SUNNY! 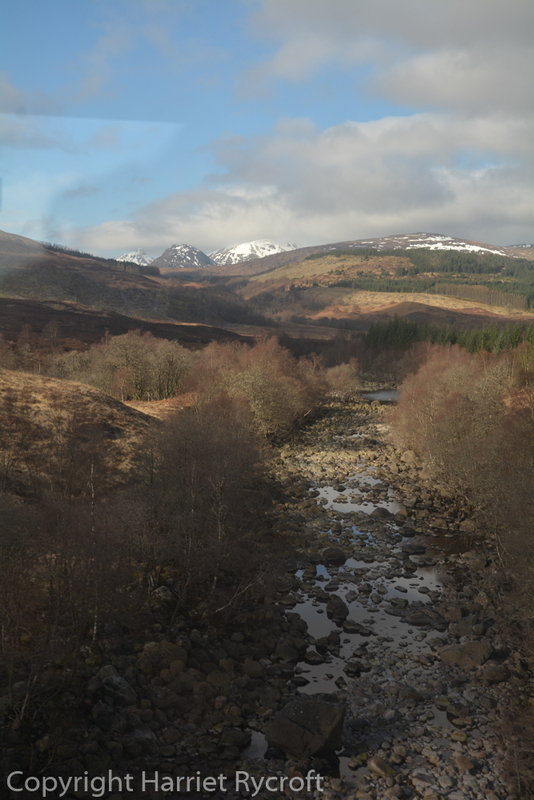 Glenfinnan Viaduct. Who needs a flying car? Looking down from the viaduct. Are you paying attention, Harry? 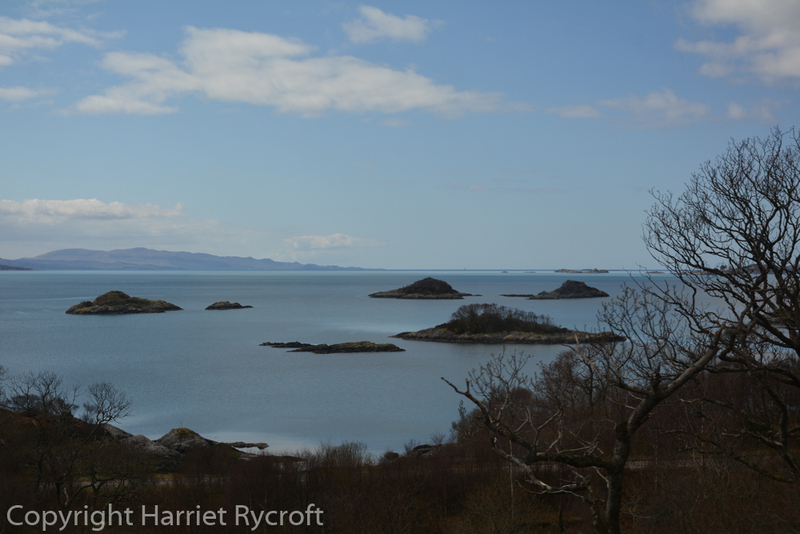 Passing Arisaig, The islands of Eigg and Rum in the distance. Big Big Train is a Prog Rock group Chris really likes, find it here. My favourite part of the world. I’ve often wondered about the sleeper having opted for the long drive on each trip so far. Maybe we’ll wait for the refit but it does sound a very civilised way of travelling. 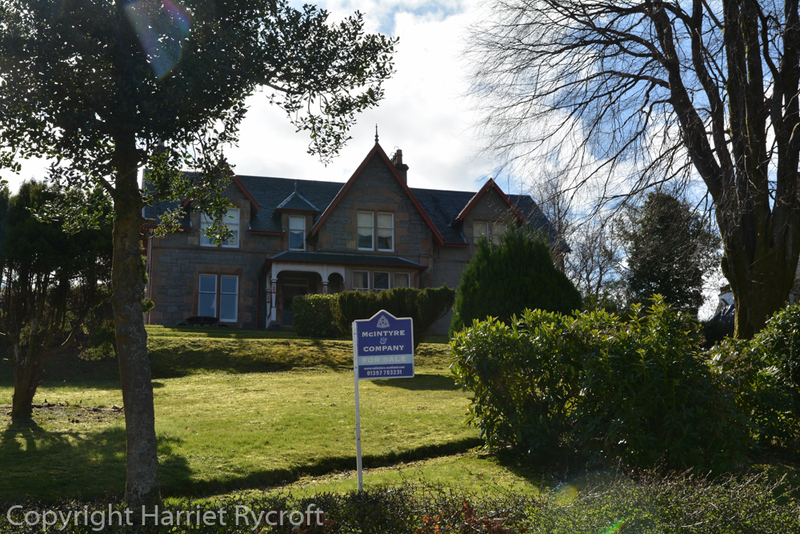 I think I’ve stayed at Arisaig House, looking forward to that post too. The slight shabbiness wasn’t really a problem, and the staff were lovely but the catering could be improved a lot quite easily, I’m sure. It was great fun and I’d love to do it again. Wonderful scenery just from the train. Great viaduct – I love a good viaduct. 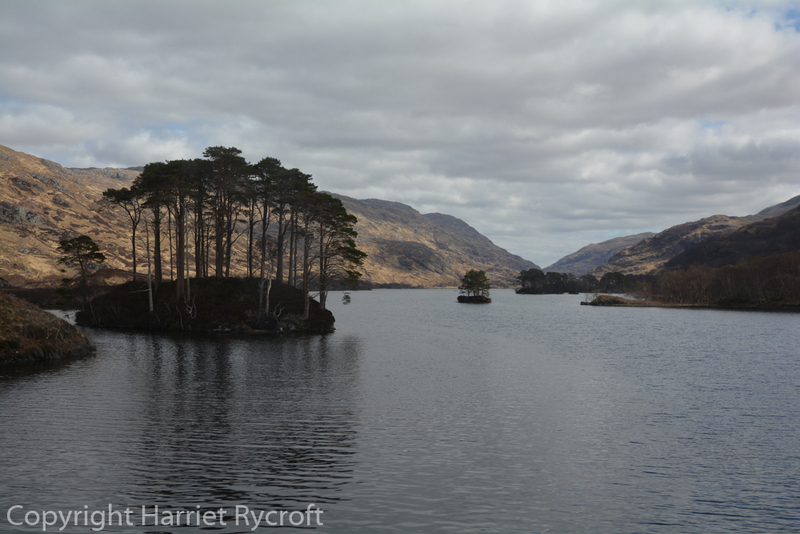 Another beautiful part of Scotland I’ll have to visit one day. Look forward to the next post of this adventure. 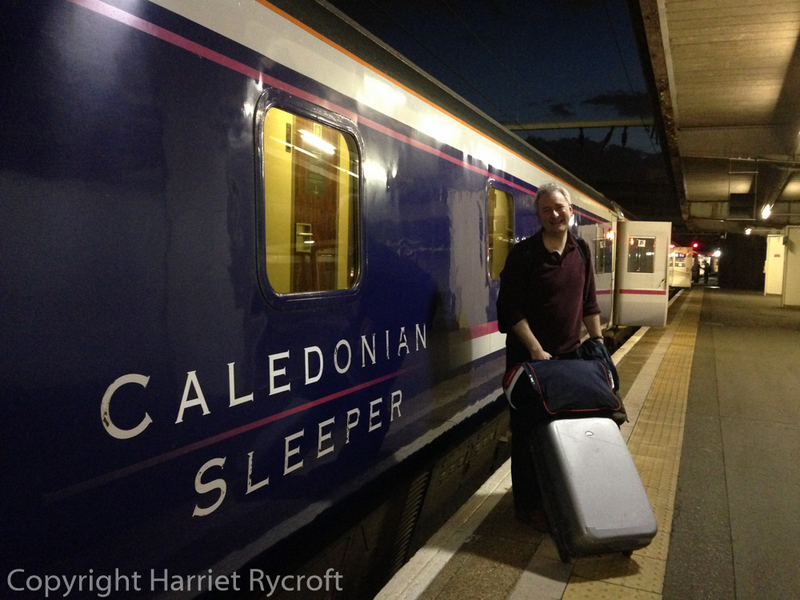 Btw: just last night I was reading Bill Bryson’s ‘The Road to Little Dribbling’ & he said the same thing as you about the Caledonian Sleeper. I’d love to do that trip & like Jessica I’ll wait for the refit. And maybe some weight loss! Hi Julieanne, it was tremendous! I haven’t read that Bill Bryson – must track it down and compare notes. I was so pleased to see this! I’m going to Scotland for the first time next week and will be visiting this area. Wonderful, thank you ! Mrs B you’ll have a lovely time! Beautiful, peaceful place, friendly people. Not one for trains myself. 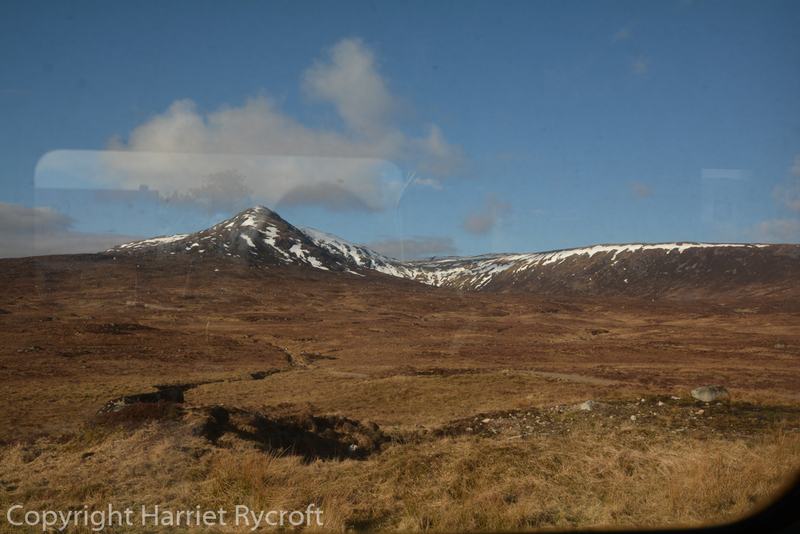 We regularly drive up to Inverness (Only 8 hours from Yorkshire!) and stay for a week or so. Often for Hogmanay if we can arrange it..
You can’t beat Scotland for natural beauty… But you can beat it for the natural beauty hidden by mist, fog and rain… The amount of times we have driven up and down the A9 with our fog lights on is amazing! 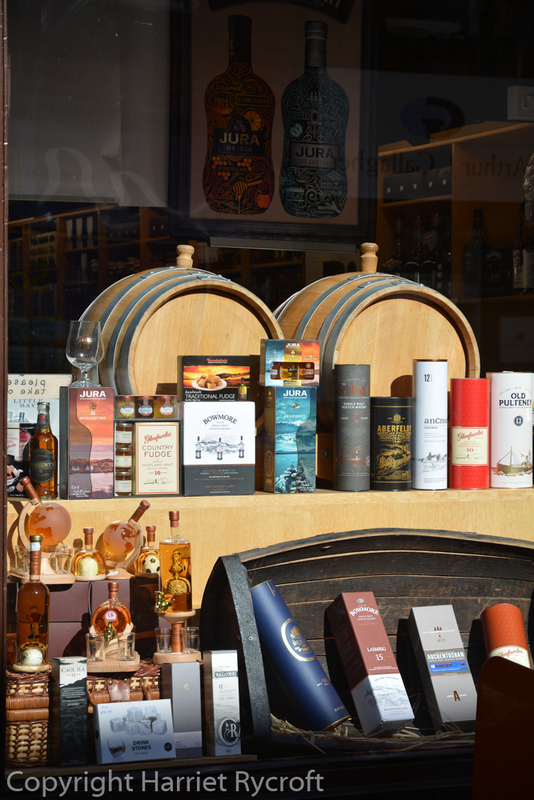 The ultimate irony is that we both go to Scotland and neither of us drink… Which seems to confuse many of the locals. Awesome photos. You did well to get them non-blurry! 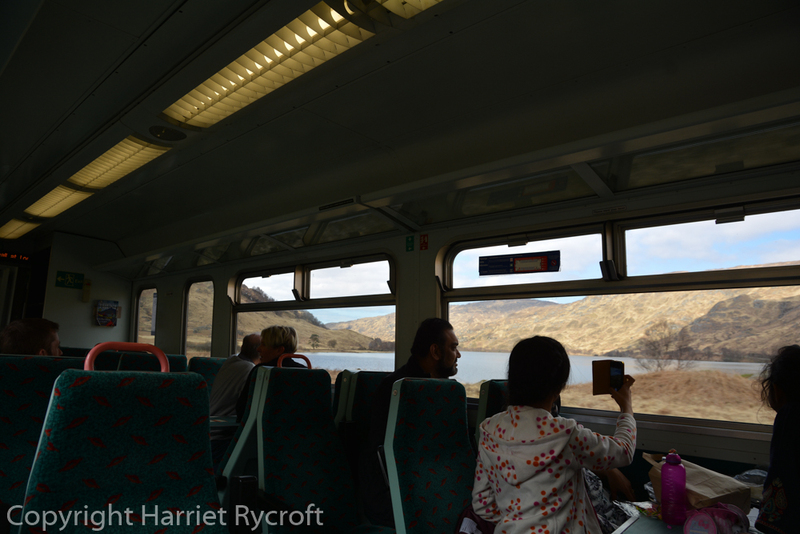 Thanks – I love trains for the fact that you can relax – no map-reading, no tired driver. I like exploring an area in a car but for me train is best for long trips. Yes I think we were extremely lucky with the weather, it was cold but clear for most of our 5 days but looked beautiful in drizzle too!